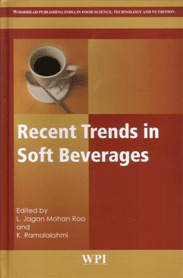 Recent Trends in Soft Beverages provides recent developments in value addition of coffee, tea and soft drinks. The book also describes their chemistry, technology, quality control with respect to raw material as well as finished product, value-added product development and marketing strategies. It is an excellent reference for researchers and students who are interested in soft beverages. L. Jagan Mohan Rao is presently working as Senior Scientist at Department of Plantation Products, Spices and Flavour Technology at Central Food Technological Research Institute, Mysore. He got CFTRI Foundation Award for his scientific and technical contributions. He was awarded the UNU-KIRIN Fellowship by United Nations University, Tokyo, and Fellowship of Institution of Chemists (India) in 1990. He is on editorial board of many prestigious national and international journals.